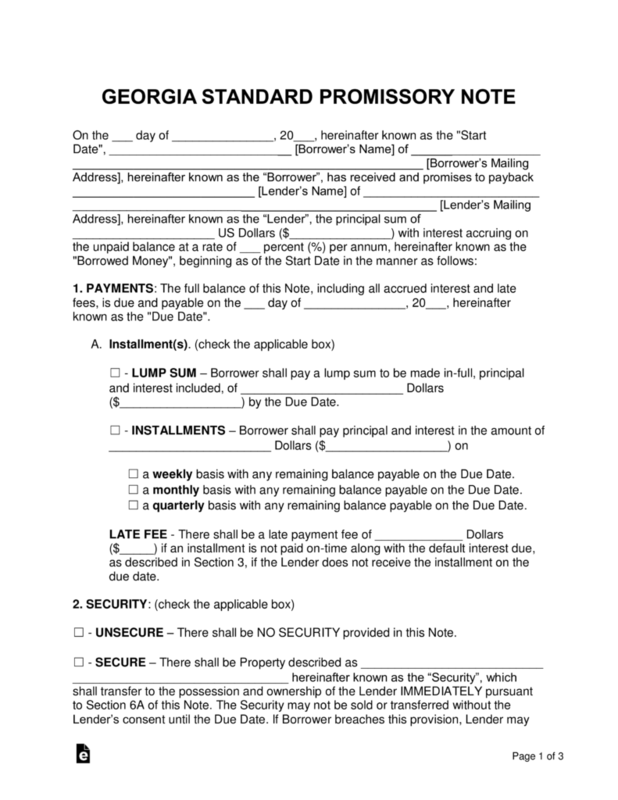 The Georgia promissory note templates are a pair of documents structured to add legality and cohesiveness to a loan transaction between two parties. The documents are completely jointly by both the lender and borrower in the transaction. In the document the parties will be required agree on sections regarding payment types, due dates, late fees, and other areas of the agreement. Secured Promissory Note – Gives the lender security in the case of a default on the balance. The borrower is required to set aside a possession such as a home, vehicle, or another worthy physical item. If the borrower ends up defaulting, the items in security will be given to the lender. Unsecured Promissory Note – This document is very similar to the secured version, but differs in the amount of financial protection the lender has in the agreement. If the borrower defaults, the lender will have no immediate way to receive his or her money. 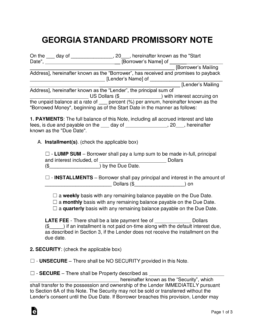 Georgia law states that the legal rate of interest when not specified is 7% per annum simple interest. For amounts between $3,000 and $250,000, the parties may agree to a rate provided that it is not greater than 5% per month. For amounts less than $3,000, the interest rate may not exceed 16% per annum simple interest. GA ST T. 7, Ch. 4, Sec. 7-4-2 and 7-4-18.